This post was sponsored and inspired by the amazing WEMO® line of products. Have you ever fallen in love with a lamp? I have. Many times. But fancy lamps can be so spendy! 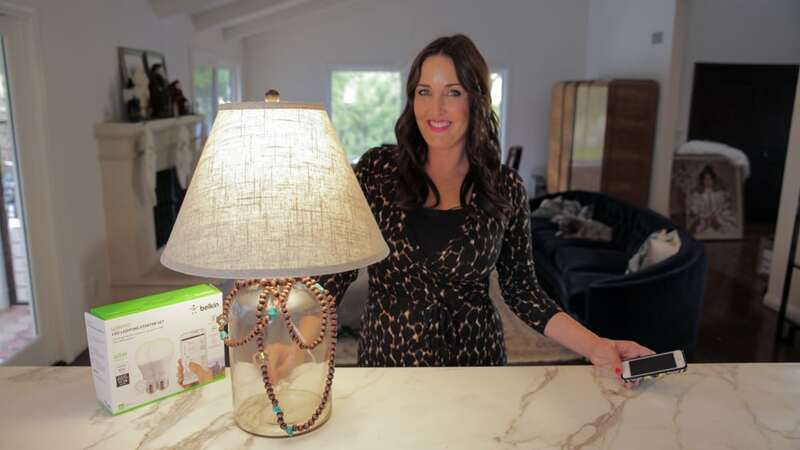 I wanted a new lamp for my living room end table, and I wanted it to have a bit of a boho vibe, with some rustic touches and a dash of turquoise. I also did not want to spend hundreds of dollars on it, so of course in true prudent fashion, I whipped one up myself. You can do it too! Watch the video above for the super simple DIY instructions. I’m so in love with my new beaded lamp! This project cost less than $40 and took about an hour. Don’t worry, the video is not an hour long. I think I achieved my boho lighting goals, would you agree? 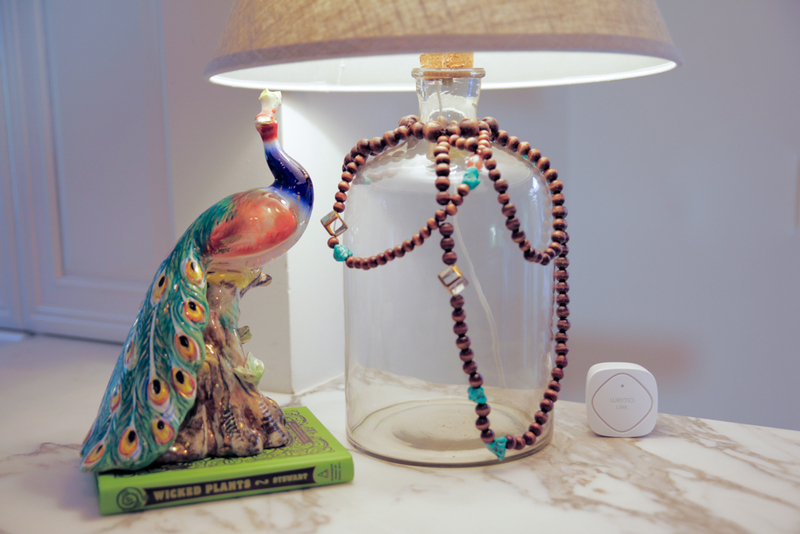 The best part is the WEMO® LED lighting, which tops off my boho styling by emitting a warm glow that I can dim for any occasion – using my PHONE! So cool. Check out the awesome features of the WEMO® products we are giving away, and enter using the rafflecopter below. -WEMO® Smart LED Bulbs are warm, bright light bulbs similar to traditional 60-watt incandescent, and they only consume 10 watts of energy and produce very little heat. These bulbs will help reduce the amount of energy you use and help with your cooling costs–saving you money. With a life expectancy of up to 23 years (based on 3 hours of daily usage), these may be the last light bulbs you ever buy. -The WEMO LED Lighting Starter Set lets you access and control your WEMO Smart LED Bulbs from anywhere, using your existing home Wi-Fi network and mobile internet. Dim lights, turn them on or off, or create a custom schedule that works for your family. You can also set your lights to turn on automatically at sunset, dim them to watch a movie, or turn them off after you leave home, all from your smart device. -Use the free WEMO® App to create custom schedules for your home lighting. You can ensure the lights are always on when you come home from work or turn specific bulbs off every day to reduce power consumption. -The Wi-Fi® enabled WEMO Light Switch allows you to turn lights on and off from anywhere-from across the house, from the backyard, or from the other side of the world. WEMO Light Switch replaces a standard light switch in your home and can be controlled remotely with an Android smartphone or tablet, iPhone, iPad, or iPod touch. It works with your existing Wi-Fi® network and anywhere your smartphone or tablet has an Internet connection. -The Wi-Fi enabled WEMO Insight Switch connects your home appliances and electronic devices to your Wi-Fi network, allowing you to turn devices on or off, program customized notifications and change device status – from anywhere. WEMO Insight Switch can monitor your electronics and will send information about the device’s energy usage directly to your smartphone or tablet. Perfect to pair with space heaters, wall A/C units, TVs, washers, dryers, fans, lights and more. -The WEMO Insight Switch can help keep your home energy bills low by allowing you to set schedules, monitor energy usage on electronics, and find out which devices are used most often. WEMO can notify you instantly if home electronics have been left on and you can choose to either leave them on or turn them off from anywhere. Find out if you left the A/C window unit running and turn it off, find out if the kids are playing video games instead of doing homework, or schedule a space heater to turn on five minutes before you walk through the door. Hope your holiday is merry and BRIGHT! Good luck! I have so many ideas for lamps!!! Fingers-crossed 🙂 Thanks for a great giveaway! Lunch. I wish I could automate my kids school lunches. I want them to be healthy a creative and yummy but I despite the time it requires to do it. I wish dishes and laundry cleaned themself. I wish I could automate dishes and laundry! Beautiful lamp that I would love to make, but the lightbulbs!!!! OMG, I had no idea something like this existed. Awesome, going on my xmas list for sure (yes, I am asking for these Jeston-esque lightbulbs for Christmas, that’s how cool they are).